Bring the wonder of the night sky to your articulation therapy! This interactive speech therapy activity targets /s/ blends in all positions of words. There are 14 target pictures for each position - initial, medial, and final. This product is great for non-readers and to add to a space or camping theme. 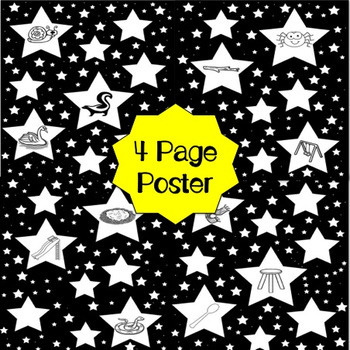 Articulation Night Sky Posters - For each position there are 4 pages to be assembled as posters. You can secure the poster to the bottom of a table and have your student lie on his back under the table so that he is looking up at the stars or secure the poster to a wall. Use a paper towel roll as a telescope or turn off the lights and use a flashlight to shine on the stars. *Working on multiple positions? Make a giant poster! Ink-Saving Stars - Running low on ink? No problem! Cut out these stars to glue to your own poster of black construction paper or secure individual stars to the bottom of a table or around the wall. 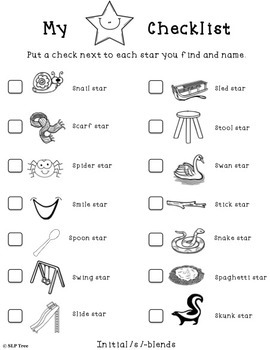 Checklists- Each target position has a checklist for students to mark off when they have found and named the matching star. 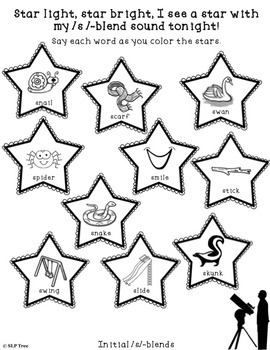 Star Light, Star Bright Worksheets- Each target position has a worksheet for a follow-up activity or to send home for extra practice. Please ask any questions prior to purchasing. I hope you enjoy this product! Thank you! Provide Feedback! Each time you give feedback, TPT gives you feedback credits that you use to lower the cost of your future purchases. I truly value your feedback as it helps me to edit and make new products that will fit your specific needs!